His business is thriving and he credits the growth in part to the extra exposure he gets through the partnership between the Finger Lakes Wine Country Tourism Marketing Association and Destination Travel Network. By adding a digital advertisement on FingerLakesWineCountry.com to his marketing plan, he’s reaping referrals: eight times more referrals than his lodging listing alone in fact. Come along and explore how Vineyard Villas came to be, and where they’re going using digital advertising. Vineyard Villas: a resort in wine country. 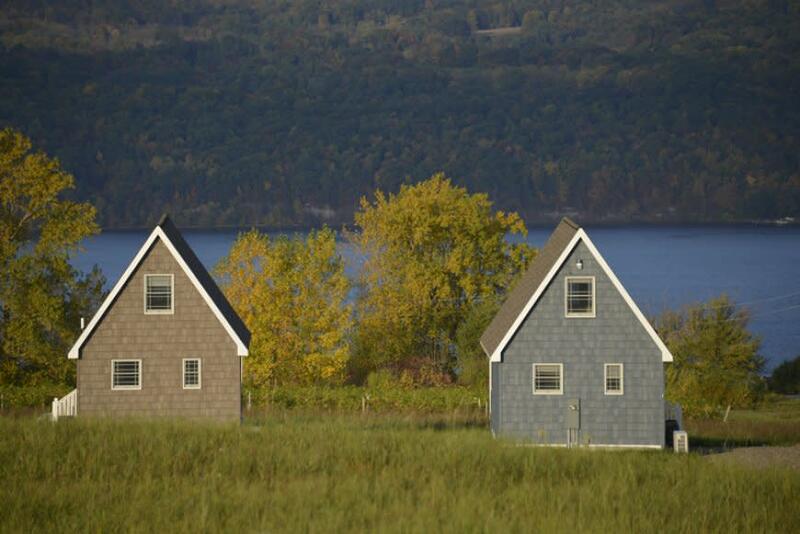 Each one-bedroom, two-story Villa is located in the heart of the Finger Lakes and along the wine trail, offering panoramic views of Seneca Lake and the surrounding wineries and breweries. The thoughtfully designed vacation rentals have both a deck and a balcony overlooking the east side of the lake and vineyards, offering guests full access to the breathtaking views. The property also includes a half-acre pond, fire pit, barbecue grills and picnic area. So where does a contractor turned vacation rental developer and owner go to market his new property? Finger Lakes Wine Country Tourists find Vineyard Villas through digital advertising powered by the tourism association. After researching his options, Rico looked to Finger Lakes Wine Country Tourism Marketing Association and digital advertising available through the partnership with Destination Travel Network. As a tourism business, Vineyard Villas received a listing on FingerLakesWineCountry.com in July 2015. By October of that year, Rico discovered there was more, with the digital advertising program offered on his official tourism website through the strategic partnership with Destination Travel Network. His business has been seen on most pages of the website ever since with great results. This past year he averaged eight times more clicks monthly then he did with a standard Places to Stay listing, and his click-through rate remains the highest of all the advertisers on the website. The Run of Site placement gives Vineyard Villas higher visibility as it is seen on nearly every page of the website. And as a savvy marketer, Rico tracks where his bookings come from by asking his guests and looking at website analytics. Since joining the DTN Ad Network, he can trace many of those reservations directly back to this digital advertisement. “I remembered the Finger Lakes Wine Country Tourism Marketing Association’s advertisements from my own visits to the area and I know a lot of people use FingerLakesWineCountry.com to plan their vacations. I wanted the Run of Site banner to get the most exposure I could using an ad that guests can actually direct-click to my online booking page on my website,” he says. The vacation property is doing so well Rico is expanding by renovating a home that is on the property. By summer 2018, he expects the vacation home will be ready to welcome wedding parties and groups. “I get requests from large families that need places to stay. This home is just below the Villas and offers the same excellent lake views and is within walking distance to the grounds. Every guest will have full use of the amenities and fire pits,” he says. From his camper on a seven acre property to a vacation retreat with six two-story Villas and a vacation home coming soon—Rico is creating a wonderful place for people to experience Finger Lakes Wine Country. Destination Travel Network is happy to help guests find this beautiful retreat through FingerLakesWineCountry.com. You can also learn more about Vineyard Villas online and follow Vineyard Villas on Facebook. If you own a business and would like to see if your tourism bureau participates in a digital advertising program, contact your local CVB or tourism office. Or you can learn how to become an advertiser like Vineyard Villas directly from Destination Travel Network.